One summer day, a merry Grasshopper was dancing, singing and playing his violin with all his heart. He saw an Ant passing by, bearing along with great toil a wheatear to store for the winter. “Don’t worry about winter, it’s still very far away”, said the Grasshopper, laughing at him. But the Ant wouldn’t listen and continued his toil. 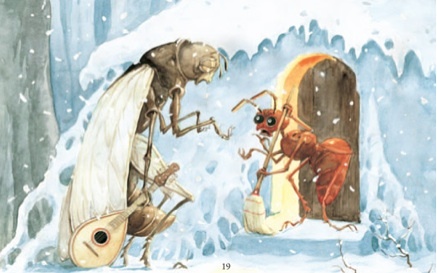 When the winter came, the starving Grasshopper went to the Ant’s house and humbly begged for something to eat. “If you had listened to my advice in the summer you would not now be in need,” said the Ant. “I’m afraid you will have to go supperless to bed,” and he closed the door. Moral: It is best to prepare for the days of necessity.